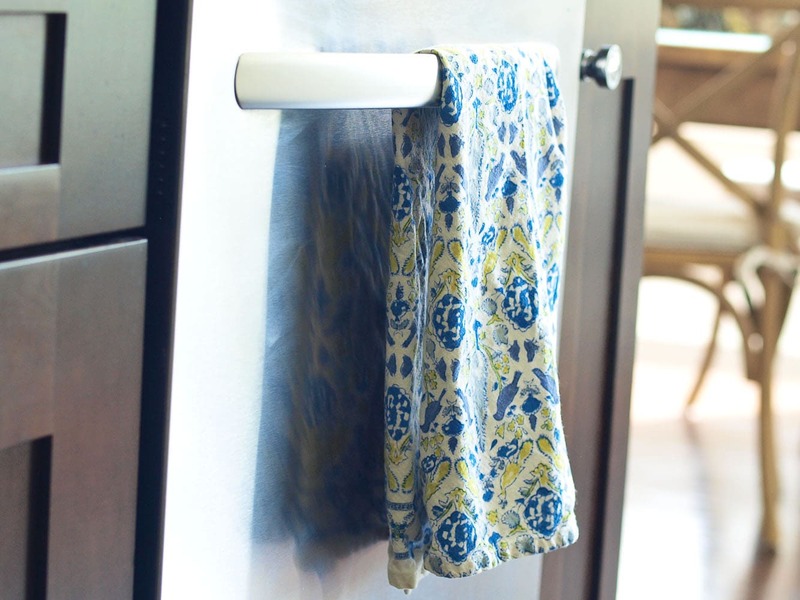 It’s easier than you think to replace paper with cloth in the kitchen. Here’s how my family stopped using paper towels and transitioned to a paperless kitchen! Happy Earth Day! I thought today was the perfect day to tell you about my family’s transition to a paperless kitchen. Over the years, I’ve been on a slow journey towards a greener lifestyle. Certain things were easy, like ditching plastic water bottles, because not only was that a good choice for the Earth, but I also had a vested interest in my family’s health. Eliminating paper in my kitchen seemed much more daunting. Paper towels and napkins have become so ingrained in our society as the standard, and reaching for them was second nature, making the task of getting rid of them overwhelming. Even though I knew it was a greener, less wasteful choice to get rid of paper products in my kitchen, I wasn’t sure I was ready to let go of the convenience factor. Well, I’m here to tell you my fears were unfounded. Going paperless is so much easier than I anticipated! These are the steps I’ve taken to replace paper towels with cloth and transition to a paperless kitchen. If we can do it, so can you! 1. Set a timeline for going paperless. When I decided once and for all I wanted to go paperless in our kitchen, I set a timeline in my head. I had large amounts of paper napkins and paper towels, but said that once they were gone we’d be completely paperless. I used that time when those products were running out to make the transition, so it wasn’t a cold turkey kind of thing. We started by using cloth napkins for dinner only, and would use the paper napkins other times of the day when we needed a napkin. I tried putting the roll of paper towel in a less convenient place so I wasn’t so used to grabbing a paper towel for every little thing. For us, a slow transition was key. 2. Stock up on enough cloths to replace napkins and paper towels. You want to make sure you have enough cloths that you aren’t doing laundry everyday. I’m not doing more laundry than I was before. I just throw the cloths in with the rest of the towels I’m washing anyway. We have 20+ cloth napkins on hand. I didn’t buy them all at once. Some are from way back when we got married and registered for them and a whole bunch are random napkins I’ve picked up over the years for my pictures for this blog. We don’t care that they don’t all match, in fact I kind of love that they don’t. You can pick up cloth napkins whenever you see them on sale to start your collection. Great stores to get for great prices, especially if you find sales, are Target, Homegoods, Pier 1, and World Market. You also want to have cloths for all the things you would normally use paper towels for: dish drying, hand drying, food drying, and wiping spills. 3. Have all your cloths in a convenient place. Our cloth napkins are in a basket on our dining table. In my eyes, it looks fine for everyday use. If we are entertaining, it’s easy enough to put away and replace with a nice centerpiece. I bought two cookie jars and put them by the sink, within arm’s reach. In one are the cloths designated for drying food, and in the other are the cloths designated for wiping up spills. Wiping up spills is probably what you use paper towels for the most. Having these in a convenient place is key. You don’t want this process to be less convenient than using paper products. If you want to know how to get rid of paper towels and made it stick, my answer is to make it EASY. The two other types of cloths we have are for hand drying and dish drying. Those are kept on separate sides in a drawer by our sink. One hand drying cloth is kept on the dishwasher handle, used for drying clean hands, and is replaced each day. The dish-drying towels are kept in the drawer until needed. 4. Have a laundry bin close by. The next part of this process if having a place to put the used cloths. Just like throwing away paper products in the trash was easy, this needs to be easy, too. We keep a metal bin in the pantry. You could use the space under your sink or on the edge of your counter. It just needs to be close so that it’s easy to throw the used cloths in there. The key to success is have a convenient system in place! I clean the kitchen cloths about two times per week, and just throw them in with the other towels I’m already washing. 5. Get who you live with on board. Whether it’s your spouse, your kids, your roommate, or all of the above, going paperless in your kitchen will be a much smoother process if you have everyone on the same page. I’ll admit that Tim rolled his eyes at me a bit during this process. When he saw the cookie jars with rolled up cloths he asked, “What, are we opening a spa? !” You’ve got to love a husband with a sense of humor. In the end, he was on board because I had a system in place to stop using paper towels and keep the convenience level the same. I know I keep saying that, but only because it’s so important! This process has been a lot easier than I ever imagined it would be. Once you have a system in place, you’ll wonder why you ever thought it was necessary to waste so much paper on a daily basis. Make the transition to a paperless kitchen and you’ll save money and not lose any convenience. You can purchase products from my affiliate links to help get your kitchen ready to go paperless! 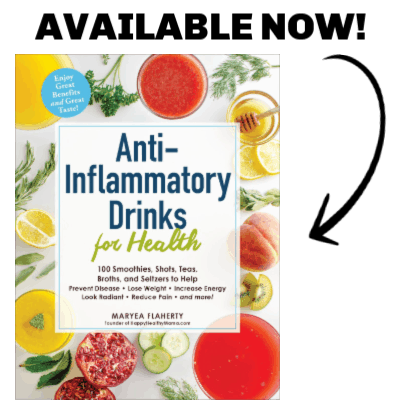 Thank you for supporting Happy Healthy Mama and my mission. 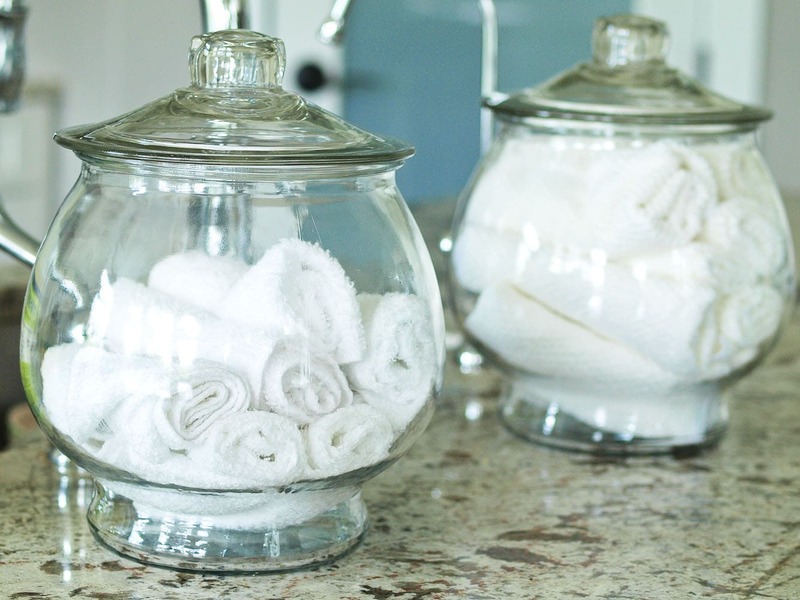 Glass storage jars like these make a pretty display for white cloths. Stock up on white cloths so you’ll have plenty between loads of laundry. 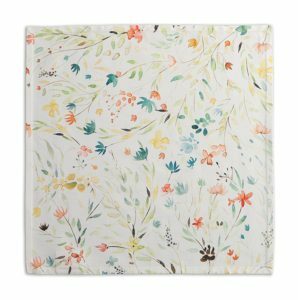 Find some cute and colorful napkins that you’ll love displaying in your kitchen. Edited to add: It’s been almost two three years now since we went paperless in our kitchen and it’s still going well! I love our paperless kitchen and hope I’ve inspired you to take the plunge, too. Great tips and your cloths look lovely the way you’ve organized and displayed them. Going paperless in the kitchen is a goal of mine too. This has me excited to get started! Going paperless as much as possible is great, but what do you use for cleaning stainless steel appliances and the glass doors on microwaves and ovens without scratching them? Cloth does not do a good job…believe me I have tried all kinds of different cloths including microfiber, but it just sort of smears fingerprints around. I tried newspaper on my stainless steel stove and was pretty upset to discover a few little scratches when I was done. So, I am back to high quality paper towels specifically for those things. Cloth also does not do a great job of cleaning granite counters, either, unless you are polishing them. I only polish about once a week and use plain water or water with 1 drop of dish soap in it, in between, but the counters do not look clean when I use cloth to dry them..They just look dull and smeared. I use E-cloth for cleaning my stainless steel, microwave, stove, oven, etc. Seriously, they are the best ever! You only need to use water with them and they make your appliances shine. I use them to clean the counters, also, and it makes them shine nicely. You can find them on Amazon. E-cloths are also carried by Frontier… you can find them locally at any health food / grocer that carries Frontier spices. I use a method, that is used by cleaning companies, to clean stainless steel. It is cheap and easy! It is simply lemon furniture polish. Any brand can be used, even from the dollar store. Any cloth can be used, microfiber, cotton, etc. I have been using this method for years and it is the only one that works for me. It is cost effective also. I use microfiber cloth. I got a large bag of them at Costco and they do a better job than any cleaner or paper product out there for glass or stainless steel. I use simple green on grease and wipe with the microfiber cloth and it shines! They are easy to wash to reuse. The longer I have them the more things I use them for. What do you use to take away the mildew smell from the cloth napkins? We use cloth napkins and I have tried using two caps full of vinegar in with regular detergent to take away the musty smell, but that hasn’t seemed to work. Do you have any suggestions? I haven’t noticed a musty smell in my napkins at all. Do you have a bottom loading washer, by chance? The only reason I ask is the my brother has one and I noticed his towels smell musty. Not sure if there is a correlation there. Once a month we do a 2 part wash on all our towels to remove build up and refreshen. First wash only add 1 cup of white vinegar (no detergent or fabric softener) and wash on hot setting. once done, repeat but replace vinegar with 1/2 cup baking soda. Dry as normal. If you let the towels dry thoroughly before adding to laundry bin, the mildew smell won’t occur as often. Vinegar in the wash gets rid of it, too. Be sure to separate cleaning towels from eating napkins. Just some ideas. I run two types of laundry loads related to towels: The nice bath linens, napkins, clean-ish tea towels (dish drying), and placemats are the first type; small area rugs, and all cleaning towels are the second. Vinegar works for any musty smells. The one situation for a paper towel, in my kitchen, is wiping down the cast iron. Fortunately, all paper spoiled by food can be recycled in our green/organic waste bins, which are composted by the waste company. Karen just make sure you’re throwing in a little bleach or powdered borax non chlorine bleach when washing the bathroom linens along with the towels that wash and or dry kitchen items. My Mom was and still is a fanatic laundry Lady. She even has two white piles of clothing. Dirty whites and bright whites. She only washed the bathroom linens by themselves and kitchen linens only with tablecloths or small fingertip towels from other places in the house. She is a smart cookie and her laundry is impeccable! You an get some lavender oil and put a few drops on an old washcloth, then throw in the dryer with your cloth napkins….works every time, if you do not like using essential oils then you can also add some baking soda to the wash water, or do both! Toss a half cup of baking soda in with the wash and use a 1/4 to a 1/2 cup of vinegar in the fabric softener dispenser of the wash cycle. This will chase away almost any smell. Try solumel from Melaleuca. Since I partnered with this company I’ve not gone back to any other products. Best decision I’ve made! Any questions on how to order, message me back! We have been paperless for about 5 years. With 6 kids I thought it would be harder but so easy. I also keep old t-shirts and cut up them to wipe for spills that we dont want to wash like an oil spoil or bodily fluids. We also use them in the garage/workshop. Works so nice! I love the idea of using cloth instead of paper but from the stand point of germs I like paper better. Using a cloth to dry dishes adds the germs back to the dishes. If using cloth to wipe the counter the same principal applies, the cloth must only be used once and not left lying around the kitchen. Another option would be t keep the cloth in a bucket of sanitizer. That is the idea… use once and place in the bin… check etsy for “paperless towels” or “unpaper towels” and you will find tons of vendors making a slightly different baby wipe for use in the kitchen. I keep mine folded in a basket like the author does table napkins. My last frontier of paper is grease… we do not deep fry or anything like that… but sometimes when I saute I still use a paper towel to wipe out the pan. You could let grease cool and then scrape it into the trash and then wash pan. Better on septic that way as well. Restaurants do keep their cleaning towels in a bleach solution. However, good kitchen hygiene in a typical home will negate the need for a sanitizing solution. 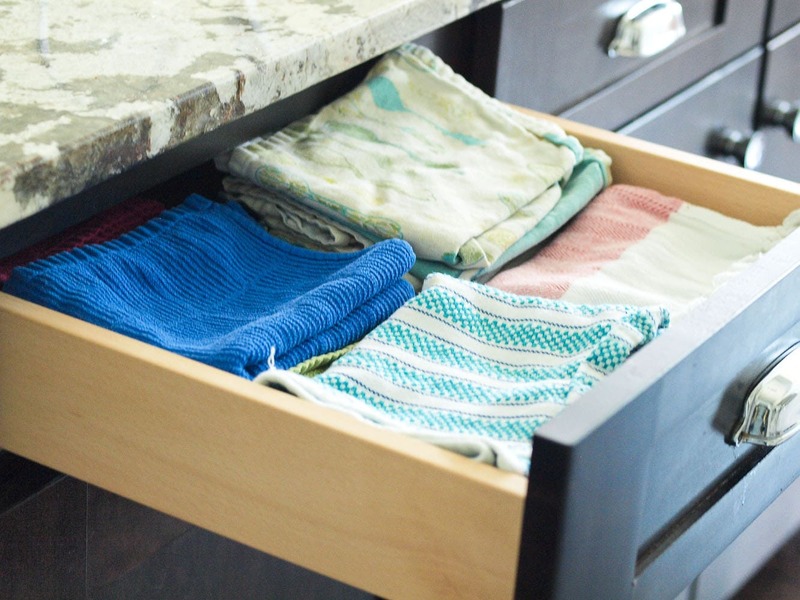 Change out your towels daily for both cleaning and drying. If working with raw meats/seafood, a sanitizer and getting a new washcloth is definitely a good way to go. With my babies and young toddlers, I designated a separate “cleaning” and “baby” washcloth each day. Huh? You don’t re-use the ones you wipe the counters with or do dishes with. My husband and I one-and-done cloth napkins for that sort of work, and then toss them into the bin we keep under the sink. Haven’t noticed any decline in convenience. How about turning the dishwashers dry setting to off, and letting the dishes air dry? I have two types of dishwashing happen in my kitchen: the many dishes, plates, bowls, cups, glasses, and stainless table utensils go in the dishwasher; the pots, pans, , knives, delicate, small items, and single items which I’ll need before the dishwasher is run, are all hand washed. If I don’t let them airdry in the drainer, I use a tea towel to wipe them. I keep three types of towels handy: hand drying, dish drying, and clean up. All of these are tossed into the laundry pile frequently. Do you color code to know which is which…? I love this idea! We have a handful of cloth napkins, but I feel like we run out too quickly. I definitely need to stock up on more before I quit buying paper towels all together. 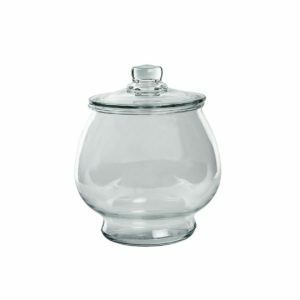 Your cloth jars are super cute! Thanks for the inspiration! If you quit first, then you will have a greater need and excuse to stock up…and with the money you were going to use to buy the paper towels, you can buy a few cloths. Every time you realize that you are in need of paper towels, go grab a few cloths instead. Soon, you will have more than enough! Try giving each person in the family their own napkin ring. That way a napkin can often be used several times before it has to be washed. We have wooden fish rings with each name written in the bottom. They ho into a basket between meals. My kids got into it and now buy fun napkins as a gift for me. Where did you get the napkin basket? There are other stores than Target. We are not buying from Target because of their bathroom policies. Sorry. Wish they would wise up. Always loved to shop there. Way to exercise your rights! No two people are going to agree on everything, it’s just a fact of life. Instead of trying to force everyone to think like you, as some try to do, just go somewhere else! We all have that freedom, the ability to choose somewhere else. It’s illegal to have a monopoly for a reason. I get quite irritated when people get offended by someone else’s choices and try to make them change. Sorry for the political interjection on a much more wonderful topic. I live in a house with people who are resistant to change, but fully intend to use ALL cloth products instead of paper when I have a house of my own. I have a question for everyone… how do you drain bacon and cooked ground meats if you have not paper towels? We cook bacon in the oven on parchment paper but when we take it up, we always drain it on paper towels? Even is you squeeze all the grease out of cooked ground meats, there is always more to get rid of via paper towels. You can’t do this with cloth towels unless you throw them away! So how do you all do this? I use old towels that I reserve only for that use. I keep a can in the freezer and pour the cooled grease in it. When it’s full I toss it out and start with a new can! 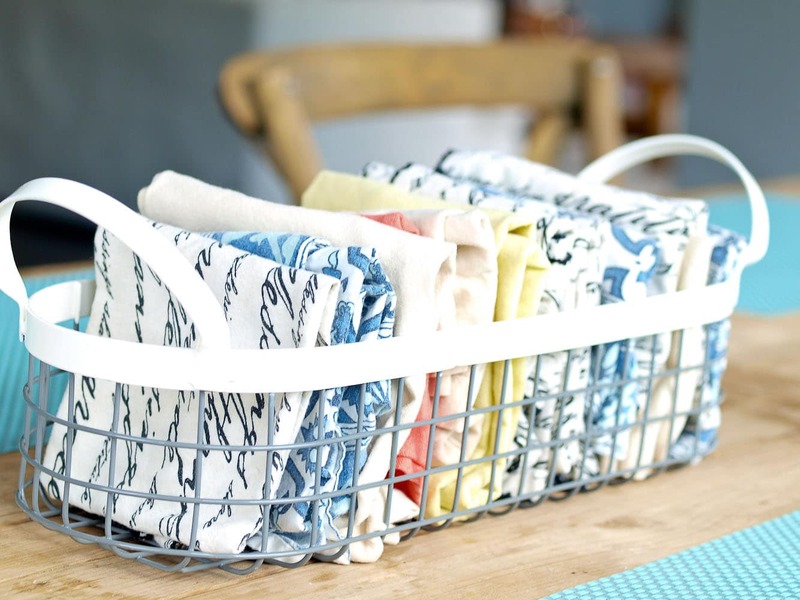 How do you launder your ‘pretty’ napkins? I only use boring white napkins because the only way I am able to remove food stains is with bleach. Now, how you do you get a stubborn husband to use the cloth napkins? I have b o idea why, but he thinks it’s “gross.” He’s infuriating. by not having any paper napkins in the house? and the cloth one is his only choice? might ask him what type of cloth he would rather have, maybe a softer one for napkins, like flannel or something? simply buy a yard, cut it into the same size as a paper napkin, and zigzag the edges. super cheap. i actually found a flannel baby blanket at a garage sale for a quarter and did that. my family loves the flannel cloths over regular rags for napkins. I use a variety of cloths. I’ve found it much cheaper than buying paper towels every week. I love the look of them not matching, too! The cloths are slightly different. The ones for wiping up spills and the counters are more absorbent. The ones specifically for drying food are cheaper cloths. I also wanted to make sure we didn’t accidentally dry food with a cloth used to wipe up the counter if one was left out. Super cute idea. Going to try this. Its simple and saves tons of $$$$$! We are mostly paper free in the kitchen. My husband takes a sandwich to work everyday and I wrap his sandwich in a paper towel and then a sandwich bag… I want to get away from doing this as one of the final steps to paper free. We are in the process of moving to cloth wipes since we have cloth diapers and after that the only paper we will have is toilet paper. I hadn’t even thought of cloth wipes for using when doing cloth diapers. Where do you get yours?? How do you like it compared to disposable wipes?? We LOVE the convenience of cloth wipes – just toss them in with the diapers! You can buy them at most places you can get cloth diapers at or just use baby washcloths or make your own out of receiving blankets. Pinterest or Google can provide directions for making wash solution. For my husband’s sandwiches I use square glass containers with a lid. In one goes bread and in another goes filling. Works great, zero waste and glass won’t retain the smells if he forgets to bring it in as well as it cleans better if he overheats something in the microwave. What do you use for wiping grease out of skillets or pots after deep frying? I can’t imagine putting a cloth loaded with grease in my washer, with or without other towels; nor can I rinse the grease out of the towel down the sink. Thanks!!! I don’t do any deep frying, but we do occasionally cook bacon. In those instances we have a roll of paper towel on standby (in an inconvenient place, so we aren’t tempted to use it too often ;-)) While my goal is to not use paper in the kitchen, there are definitely a few instances where it’s unavoidable. I have heard of people saving certain old cloths just as a dedicated grease towel; maybe I’ll get to that point! Before when people didn’t use paper anything they used mostly cast iron. Most grease would be poured into a tin for later baking/cooking. The little bit left would season the pan. That’s what I remember my dad doing when I was growing up! Use newspapers/flyers to wipe off grease from the pans and skillets. I also use them to line my counters while cooking. Just wrap them up and throw them away leaving counters mostly clean. They absorb any spills and grease particles. And best of all they don’t cost you a dime! Along with your kitchen being paperless, it looks beautiful! I love all of the colorful napkins and towels. Even the white clothes in the jars look pretty! I’ve been mostly paperless in my kitchen for several years and we are happy with it here. I do keep a roll of paper towels, like you, for when something is really nasty/greasy. 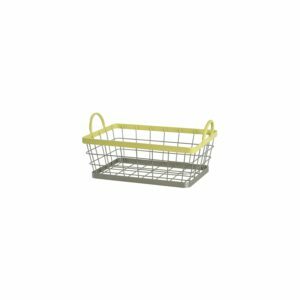 But I have cloth napkins in a basket on the island counter, small cloth towels made from birdseye diaper fabric in a basket by the sink and a basket right next to it to drop in the dirty towels and napkins. The white towels get bleached once in a while when I’m doing other bleachable whites. I also have a regular dish/hand towel hanging conveniently and it gets changed daily. I don’t dry many dishes because most of mine go through the dishwasher and large pots just air dry in the rack. Hubby has gotten very good at following the easy system and is totally on board with it. I also use cloth wipes in the bathroom (Just for ME and just for number 1!) I have a basket of wipes and a mesh laundry bag holds the dirties. They get washed once a week with the whites on hot, occasionally getting bleached….once or twice a month. Men don’t use much paper and I wouldn’t ask the rest of my family to do the cloth wipes if they were still at home. Some people just get all “eww” about it. I cloth diapered all three babies 30-40 years ago and I don’t find the cloth wipes objectionable…..besides, I’m the only one doing the laundry here, LOL! I love your method for reusables in the bathroom! Thanks so much for your kind feedback, Leah! We are mostly paperless in our home also. I made some unpaper towels out of dishtowels and we use cloth napkins. I made a wet bag out of some pretty PUL fabric and hang it on my kitchen cabinet below the sink. It works great to put the dirty cloths in. I use cloths to clean, and launder them as needed. People think I’m crazy but that’s ok because I know I’m saving money and not wasting paper. Glad I found your website. I like the idea of the jars. I have a basket on my counter for the towels but I think I like the jars better. So much prettier. Thanks, Vickie! I’m glad you found my site, too. 🙂 Your fabric bag sounds like a great idea. My family only uses paper (saran wrap, foil and bags) for long term food storage. To save on costs I just bought basic wash rags for the family to use as napkins. I use the same towel to dry hands and counters/ dishes because I change my towel at least once a day and they are used for drying things only. You could use Norwex cloth for antibacterial wipes got countertops. My uncle uses microfiber cloth on his black granite and it’s always pristin. The key with microfiber and norwex is to not launder them with anything that makes lint. I usually hand wash with dawn or do a small load alone. That way they stay clingy and don’t get smudgy and loose their absorbency. Hello, My question is, do you the “wipe up spills” cloth to clean countertops and table after dinner? Not necessarily a spill, but just everyday cleaning? is there a certain type of cloth that works better? No, I use ecloths for general cleaning of the counters. They are a special cloth (similar to Norwex, I believe) that you only need water to clean with and I love them. I use them to clean the counters, microwave, stove, etc. can you use ecoths to clean up grease and oil, etc? I love how much thought and organisation you have put into this – great idea for the convenient storage, I love the basket on the table and cookie jars full of cloths! One of my challenges to my paper-free house is how to wash all the cloths I use to clean — meaning, which cloths to wash with which / or NOT to wash with which. I use several different cloths in the kitchen, as you do::: napkins (for people during meals), wipes (for counters and spills) and towels (for hands and dishes). I tend to use a “natural” brand of counter-cleaner to spray on counters and wipe with cloth wipes — but sometimes I do get nervous that the wipes which cleaned the counter with counter cleaner get washed with my napkins, which then get used on my kiddos face….. Anyone else nervous about that? Secondly — I also have another stash of cloths (stored out in my laundry room) that I use for house-cleaning (bathrooms, spills on floors in house, cloths I use over a mop with floor cleaner). I go through fewer of these — and feel even more hesitant to wash with other towels, etc — but can’t just have them sitting around waiting to be cleaned. Thoughts on washing all these cloths??? I wash all my towels all together with hot water. I use mostly water for cleaning my counters because I have ecloths, which are antibacterial cloths that work with only water. (I should have mentioned these in the post, I guess…I store these under the sink) Maybe someone else will chime in and give you different advice; I hadn’t thought too much about washing all the different towels together, but now you have me wondering. i wash all of my towels/rags/cloths together. i use vinegar and dish soap for almost all of my cleaning (bathroom, kitchen everywhere). the washer gets it clean. i make my own laundry detergent, but ill buy commercial stuff and wash my rags with it because of the better oil releasing properties ( i have 2 kids who are learning to cook and have a tendency to have a heavy hand with the olive oil!). if you are concerned that the cleaner you used didnt get all washed out, wash your rags twice. if your concerned about the germs and cross contamination, use bleach and hot water. I enjoyed your article and have two comments. One – Regarding washing the towels – I use mostly just water with microfiber cloths. When I do need a cleaner, I use a ‘green one. If you use hot water, the towels can all be washed together without any harm. Two – I use bar towels for wiping up spills etc They are white and bleach beautifully. 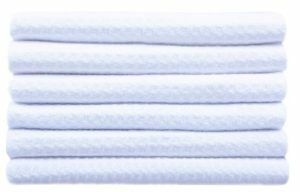 For napkins – we just use dish towels from Doller Tree! They do the job, wash up nicely. Love the idea of going paperless. You’re welcome, Karen! I’m glad I could inspire you. Would you please tell me what. Kinds of cloths you designate for each task? And how do you know what’smore absorbent wwhen you buy? Is it just trial and error? For drying the food, I just use flimsy dish cloths. They work fine for drying food. For the messes, I use a microfiber cloth that is more absorbent. I could just tell when I bought them that they’d be better for cleaning up spills, etc. For drying dishes I use a variety of different kitchen towels. i purchased cotton yarn for the cost of a pack of paper towels. I crochet my own dish cloths, over mitts and small towels. Sturdy fabric scraps can be made into napkins. Wow that’s wonderful! I’m not much of a sewer or crocheter, but always wish I had those skills. I like this post. Paper towels are so expensive and not good for the environment. I go to the thrift store to buy clothes napkins. I can get 8 napkins sometimes for $1. A lot of times they have barely been used or not used at all. I like the cotton variety, but the polyester type resist stains more yet don’t absorb the same. I have been collecting for a couples of years now and have about 70 to choose from nice is the variety. We have towels that are set aside for drying dishes- they ate a different color/style then the others- to prevent cross contamination of bacteria. Wow I will have to check the thrift stores! I’m happy to see so many people going paperless! 🙂 I use cloth napkins at dinner, but during the day for quick meals like a sandwich, I use 100% cotton bandanas as a cute and colorful replacement for paper napkins. I recently picked up a set of vintage inspired 100% cotton 12×12 hankies and these work great, too. I was sent a sample of Bambooee, which are machine washable, reusable, bamboo paper-sized towels. I was really impressed by the softness and durability and am going to pick up a set of these to use for the stickiest, messiest spills that inevitably happen. Great post, thanks for the inspiration! Oh I will have to check out Bambooee–thank you! I think it’s the idea of it that makes it difficult, but in reality, like you said, it’s not that hard! Thanks for sharing your story. im not sure I agree with this being any better for the environment as papers are compostable and in order to wash all of these rags you’re using a)hot water (which requires energy to heat) and b) presumably Bleach. Now if you have a septic system that your washer water enters, you’re essentially working towards killing the bacteria in your septic which means… No degradation of human waste, filled to capacity septic and the requirement of more frequently having the septic pumped out. Thanks Maryea for sharing your great ideas! Your tips, & those of other viewers, have inspired me to go back to using more cloth. Anyway, I’m off to find some great buys on cloths! Love how you have all this organized! I have been working on going paperless as well. I’ve been meaning to get more organized to get the kids and husband using more cloth for cleanup. I wanted to offer my solution for cleaning up greasy pans and other gross stuff. I save holey socks (after cleaning them one last time). The more cotton the socks have, the better they are at picking up grease. Once used, toss. Great idea! I always just throw those holey socks away anyway, might as well get another use out of them! Hello there Maryea. I just popped in from Pinterest. I have as a goal to be paperless in the kitchen before Summer. I loved some of the pointers for making the transition as painful as possible. Especially for the guys. Thanks. Is there a difference between the cloths for drying food and the cloths for cleaning up spills? Wondering if it is necessary to have 2 separate jars if the cloths are the same? Thanks!!! I use different cloths for spills and drying food. The drying food clothes are cheaper, thinner cloths than the ones I use for spills, counters, etc. I’m attempting to go paperless and the paper towel is such a problem for hubby. Bless his heart, he doesn’t just use 1, he uses 3,no matter the job. I purchased 12 bar mops and placed in a basket next to the sink. I faithfully use them. The problem I have is they are so stained after just a few months. How do you keep them presentable? Oops sorry I forgot to answer your question! Mine are pretty dingy, but I don’t mind. I have bought new ones once in a year. Your idea is an absolutely fabulous one. Your display is very attractive. I am certainly going to work towards going paperless in my kitchen. Thanks for the great tips! Always so good to see how many are interested in our environment. I’ve been buying the small inexpensive white wash cloths at WalMart to use for napkins for my family to use. When friends come I will use the nicer cloth napkins. I cut up old bath towels to use for cleaning. Even if they stain they do not offend me because I know when I launder them they are clean. That’s a great idea! I was just noticing a bunch of my bath towels are barely hanging by a thread. I think I’ll cut them up and use them for the greasy messes! I buy inexpensive white bar mops in packages of 6 or 12 for napkins for everyday use. They are 12″ white cotton and terry fabric cloths. And they are sturdy and can be used damp for messy meals like ribs 🙂 Great for the little ones too as they can be dampened and used to wash their hands and faces after their meal. They can be bleached as needed and they do not stain much because they are washed frequently enough that the stains don’t set. They’re not pretty but they are clean and so practical! I do have some nice cloth napkins, for when we have guests and special occasions! Now moving on to doing without paper towels as well and planning to continue until we are paper free, except for tissues and toilet paper because ewwww…. Going paperless in the kitchen… I started this path in 1992 when my kid was a babe in arms. I started with washcloths as napkins, and we graduated to proper napkins, well, with a stop for bandannas, about three years later. I started with a bag of red shop rags for cleaning of anything on a surface, and a dozen tea towels for hands and dishes. I buy one roll of paper towels a year. About half get used in latke season, over some local alternative newspapers, and the rest on stuff I never want in my laundry. I use warm, not hot water, and no bleach, so I have to be a bit aware. I will put the questionable towels in the sun for a day. Sometime in 2007-08, ecloth sent me a sampler pack. I was an environmental issues reporter (as well as everything else aside from sports). It’s one of two “green” products I still use. The same three ecloths, and three nylon mesh produce bags. I still use my first grocery tote, acquired in 1989. Canvas does last much longer than nylon, but Chico bags pack small for daily carry. Napkins live in a basket. Towels have a drawer. Rags are in a basket under the sink. I keep the ecloth separate and just hand wash them and hang dry. Same with eyeglasses and computer screen cloths. I hang towels, napkins and rags on the edge of the office sized trash bin that holds them for laundering. This year, I’m culling the worst of the rags and towels that are too tattered to clean even the floor. It will be my second big replacement since I started 20+ years ago. I’m always looking for ways to streamline my process. It’s a double edge sword isn’t it. I grew up with out all the paper and it wasn’t till the later 1960’s that paper towels began to show up in my Mom’s kitchen but not often because they were a bit costly for her budget. But when I had children I started using them a lot. They were cheaper then and convenient. I say it is a double edge sword because if you use a lot of cloth you have more laundry to do and cleaning supplies to buy. So is the extra water and electrical energy used to wash them really a planet saver more than using paper towels? Many paper towels come from fields of trees that were grown for the purpose of being used to make furniture and then their waste products ie bits of wood and saw dust going on to make other things, possibly paper towels, or getting paper towels that have been made from recycled products. Which is more of a saver of this planet? I have not heard from anyone on this subject but I would like to know the answer. Wouldn’t you. Myself I like cloth more than paper towels and find myself going back to their use more and more. I love the ideas you have posted here. What do you do about greasy spills. That will ruin your cloths. Or draining greasy off things like bacon etc. I’ve slipped back into using paper towels. With four small kids at home, I use them constantly. Do you have small children, and if so, do you miss them? How do you get the grease out of a fry pan? It is illegal to wash it down the drain or the cloth, sending grease down the drain. Newspaper is also paper. I use already used paper towels or newspaper, junk mail etc.. Putting the greasy washed cloth in the dryer is a good way to blow the wall off the house. Well, this isn’t a waste-free way of doing it, but if we have a lot of grease (like from bacon), I line a bowl with foil, let it harden, and then throw it away. My dad would die knowing I don’t put that grease into a bowl and reuse it, but I don’t. Other than that, we don’t have a whole lot of grease in our pans after cooking. If there’s just a small amount, I rinse it. I have never heard anything about it being illegal to do so. Where do you live? I use a throw away container, such as a yogurt or butter tub or a tin can to pour grease in after the pan has cooled. But then I use a paper towel to wipe the remaining grease from the pan. I guess if I didn’t have any paper towels at all I would save the advertisement papers, that come from the mail, to wipe the pan free of grease. After I clean it well with soapy hot water. This’s been on my mind for ever; I am partly doing it, especially for bigger spills, but I need to put this in action more, like you said set a timeline. Good luck Kay! It’s so doable!! I’ve been using cloth napkins and tablecloths for every meal for years! Here’s a hint to go even more sustainable…use a clothes line! Hanging linens out in the sunshine not only makes them smell marvelous, but it’s like they’ve been ironed! Of course there’s also the beauty in watching them blow in the breeze, quite calming like watching the waves at the beach. I love how you made organizing your cleaning cloths look so pretty!! I have taken the first step in a paperless kitchen by replacing our napkins a few months ago. We love our cloth napkins! Never going back! Next step, cleaning cloths.Question….kitchen messes are…well…dirty with food stuff, you don’t put them in a separate container than your dirty towels or clothes ? Help! This is the part that bothers me most. With 3 adults in the house we use less than a roll of paper towels a week. I buy the half size towels and often tear off just a small portion for a job. Also reuse a towel for progressively dirtier jobs. example: dry clean hands, faucet, counter, trash can lid, floor spill. I use cloth dish towels but will use paper for cast iron or aluminum. Let it dry and use again. One and done is wasteful whether cloth or paper. Unless you’re wiping up from raw meat or eggs the germs on surfaces are the same as on your plates, silverware, and anything else that you have touched. Nothing is germ free and it helps your immune system. Thank you for the great ideas! I love bringing back the cloth napkin! The pretty displays also make it an appealing transition. Couldn’t agree more with what you are encouraging people to do! Love this site and am sharing it for others. Love the idea you have for the glass jars. They look beautiful too. Thank you for sharing. It’s great seeing these ideas to help people go paperless. I’ve been there for years – I use colorful bandanas for napkins I’ve picked up here and there, and one of my sisters brings me dish and hand towels from their travels, so I stay well stocked! I use wash cloths and a scrub brush for dishes. I do have paper towels in the pantry to use for draining things when I (rarely) fry things. Between that and composting, and feeding scraps to my hens, I only put out garbage for pickup once or occasionally twice a month…. and that’s with three indoor cats and their litter boxes! Thanks for sharing so others can learn! what do you use to clean up greasy messes like cast iron frying pans? it’s held me up from going completely paperless. I have a stash of old, stained towels that I use for this. I keep them under the sink. That’s something I had to learn as I go and that’s what we’ve done! Maryea, i see responses to your original post, almost 3 1/2 yr ago, are still active. You are motivating me to do better. Good resource. Love reading all the responses since 2015. Thank you. When I worked for my room and board at a community House in the “olden day’s” ,we lived on the third floor..students. A displaced person cooked our meals. In the evening, we had assigned seats around a large table . The director was at the head of table and served our dinner plate to each of us. We started every week with a large dinner napkin in a napkin holder. We used the same one all week and a clean one on Monday. Dinner was the same time ev7ery day and in a somewhat formal elegant way. Sunday, we did our own in the kitchen. But those linen napkins lasted the week. These are great ideas! I love the pretty jars and baskets. It is much more motivating! Thanks for sharing! Do you think you do a lot more laundry or a little more laundry with this switch? Just a little more. Probably one more load per week. It’s not terrible! Instead of buying new towels and cloths, you can recycle old bath towels — cut them to size, hem the edges. Old shirts and sheets also make great kitchen cloths and napkins. So good to start being aware of how much paper we use and that there are truly ways to reduce the amount we consume.